Federated State of Micronesia: http://www.visit-fsm.org/ - Spread across 2,500 kilometers of the Western Central Pacific Ocean, just north of the equator, the four states of Chuuk, Kosrae, Pohnpei and Yap and their 607 islands (only 65 are inhabited) invite fun, exploration, excitement and relaxation. Chuuk: Also known as Truk, but was changed back to its original name in 1986 when the Compact of Free Association went into effect. The compact is a 15-year political relationship with the United States that started in October, 1986. We have been there several times now and plan on going back in May 2003. We will be staying on board the Odyssey Live Aboard and diving 4 to 5 times a day. Check out their web site. Chuuk has the best wreck diving in all the world. If interested in travel to this fantastic dive destination, contact us. The Odyssey is a 132 foot live-aboard located in Weno, Chuuk in the Federated States of Micronesia. Dive with Odyssey Adventures to see the ghost fleet of Truk Lagoon, the worlds best shipwreck destination. Thats only the beginning of your adventure. They ll take you to the outer reefs to see a pristine underwater utopia where over 300 varieties of soft and hard corals flaunt their rainbow colors. 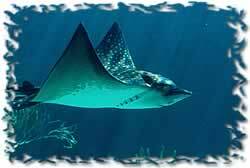 Youll see an abundance of incredible tropical fish, anemones, gorgonians, eagle rays and even frenzied shark feedings. You'll have the option to dive at your leisure, or borrow one of their experienced local dive guides who will show you all those places you wouldn't find on your own. This is for those who want to experience the highlights of each wreck. Since each day aboard Odyssey offers new adventures, no day is really typical. Nothing is routine and their schedule will vary depending on location. The day aboard Odyssey begins after a 7:00 a.m. hot breakfast with your first dive briefing around 7:45. Depending on the dive site you'll have up to two dives before lunch. During lunch they usually move to a new site. After lunch you have the option to either do another dive, or relax on the either of the sundecks or in the privacy of your own stateroom. A late afternoon dive is also offered. Around 6:30 p.m. a sumptuous dinner will be waiting for you. After dinner you may choose to do a night dive. At night guests usually gather in the entertainment lounge to enjoy a movie, or review what was captured that day in video. The Blue Lagoon Resort is the best place to stay while in Chuuk. We are requesting permmission to use some of their web information at the present time. At that time we will have more information to show you why we prefer to stay only at The Blue Lagoon Resort when staying at a land based operation. Kosrae: Kosrae is the eastern-most island in the FSM, located approximately 600 kilometers southeast of Pohnpei. Kosrae is a 109 square kilometer island surrounded by a reef. Kosrae is circular in shape, measuring only 16 kilometers across at its widest poin (see map). The second largest island in the FSM, it is the only state without outer islands. Kosrae's natural resources are the unspoiled tropical island and marine resources surrounding the island. The single island that makes up the state of Kosrae is a dense jungle mountainous island with a lush green interior and several white coral beaches around the rim. The interior of the island is characterized by high, steep, rugged mountains rising to 629 meters at Mt Finkol, and covered with dense tropical rainforests. Kosrae Nautilus Resort: at Kosrae Nautilus Resort, they have a friendly staff and comfortable surroundings just a stones throw from your your own private beach. Their resort being only a l6 room complex can guarantee you individual service and is located in tropical gardens. They have the only swimming pool on the island, and a full restaurant and bar facilities. Their rooms are all air-conditioned with 2 double beds, video movies, mini bar, tea/coffee making facilities and daily room service. If you have a chance to visit this garden island, plan to stay at the Kosrae Nautilus Resort. Palau: http://www.visit-palau.com/dest.html - The Republic of Palau, Micronesia's westernmost island chain, offers some of the most unique holiday opportunities to be found anywhere in the world. Its natural beauty, untouched wilderness, intact culture, remoteness and stability combine to offer something for adventure seekers, historical buffs, nature enthusiasts as well as those who just want to get away from the rapid pace of their lives and soak up peace and tranquility. Palau Sipadan Resort: http://www.sipadan-resort.com/ - Was one of a handful of operators allowed on this protected island for breaks in between dives. The name of Sipadan is simply legendary in diving circles, conjuring images of twirling tornados of barracudas and jacks, patrolling hammerhead sharks, millions of technicolored reef fish and, above all, dozens of sea turtles swimming peacefully everywhere. In the past year the Malaysian government has removed all resorts from the Island and has stationed a military presence to inforce the new law of keeping people from staying over night on the Island. Divers from surrounding Island Resorts are allowed to only stay for brief periods between dives. Sipadan-Kapalai Dive Resort: http://sipadan-kapalai.com/ - A few minutes by boat from Sipadan but a full world away it lies the exhilarating Sipadan-Kapalai Dive Resort, sitting on its sturdy stilts on the shallow sandbanks of the Ligitan Reefs. Planned and built in full style as an airy, comfortable, sunny water village with no land in sight, it boats a mile-long sandbank of powdery blindingly white sand where one can suntan at complete leisure. They have added more than 18 new over-water units, replacing those lost at Sipadan. They are extending the restaurant and have added a walkway and sundeck between the two major walkways for the convience of the guest. Beqa Lagoon Resort: www.beqalagoonresort.com - In the heart of the South Pacific, beneath southern skies, lies the island paradise of Fiji. If you travel to dive, eat fine food, bask in the sun, or simply to relax in a tropical paradise, Beqa Lagoon Resort, on the unspoiled island of Beqa, is what you're looking for. This secluded island has been blessed by nature with the perfect conditions for scuba diving. It is surrounded by one of the world's largest barrier reefs, providing hundreds of unique dives within minutes. Enjoy year-round warm water, and a variety of coral, fish, and sponges that you won't find anywhere else. Bali: Situated in a tropical region (with position of 8 - 8.60 S and 114.25 - 115.45), Bali is laid between two biggest ocean ; Pacific Ocean and Indian Ocean. Its position also is laid between two biggest continents; Australian and Asia Continent. Dealing and encounter with the natural effects of those contionents and oceans to Bali, we are guided to understand how the sea around Bali is so beautiful and exotic. Kararu Dive Voyages is the brain child of three young individuals who recognized the demand in the market for a diving cruise-ship operation in Indonesia that combined the traditions of this fascinating group of islands with the experience and professionalism offered by a team of western dive instructors/operators. Kararu Dive Voyages vessel the Sea Safari III is a 35m (115ft) wooden, Indonesian Pinisi-rigged Bugis Schooner constructed in 1998. Blending in perfectly with the environment, these boats are the most impressive fleet of wooden sailing vessels still in normal commercial work. The builders of Pinisi ships have strong animistic beliefs and spiritual roots that combine with their ancient construction techniques in a way of life that has changed little in centuries and which they believe will bring them prosperity and harbor them from any evil well into the future. Kararu Dive Voyages has utilized these local traditions combined with luxurious interior designing and state of the art dive equipment to meet the specifications of a first class liveaboard. The magical perfection of these vessels and attention to details, safety and well being will be fully appreciated once on board. Australia: Live Aboards like Mike Ball's ships are the best way to go when diving off Australia. Stay tuned for some first hand experiences and photos in the coming months.